Sail Far Live Free - Relent to Water Wanderlust! : It's good to be away! It's good to be away! 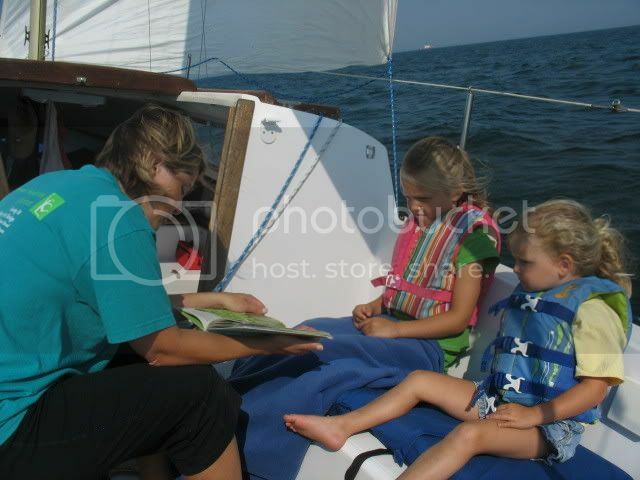 On Wednesday, July 16, 2008, we embarked on our first overnight cruise from our homeport. We had originally planned to sail from Grand Haven to Saugatuck (~24 nautical miles) to meet up with some friends who have a boat there. The voyage from Grand Haven to Saugatuck affords a couple of ports in between for weathering a storm, provisioning, etc. The ports are evenly spaced with Port Sheldon/Pigeon Lake being a short hop at 9.5nm and Holland being an additional 8nm. The forecast for Wednesday, our departure day, called for winds out of the south from 5-15 knots. This meant a tough, slow beat upwind. Luckily the seas were only 1-2 foot and the sky was clear. We stayed on Hannabel the night prior to the trip and both Erin and I woke early Wednesday morning (6:00am) with excitement, ready to begin our journey. We rounded the Grand Haven pier and headed south at about 9:00am. The girls both played for the first few hours. Our dog, a golden retriever named Shasta, slept. Then after a few snacks and a light lunch, both girls took a nice nap while Erin and I kept Hannabel on tight SE/SW tacks as we made our way south. At about 2:00pm somewhere just south of Port Sheldon we decided that we would call it a day and make port at Holland. We ended up pulling in to Holland and Lake Macatawa at about 4:00pm. The 17nm trip from Grand Haven had taken us 8 hours and plenty of tacks. 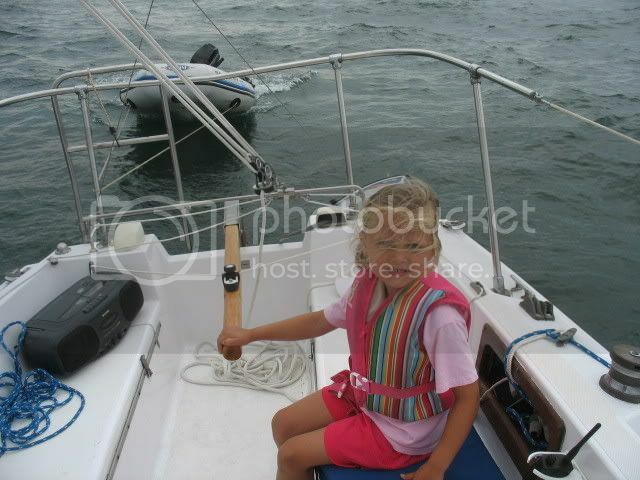 We set two bow anchors and then took the dinghy to shore to cook dinner. We were grilling our dinner on a beach about mile from our anchorage when a Coast Guard RIB pulled up and announced on their loud speaker that we should "wrap up the barbeque...there's a storm headed our way with wind gusts to 50 knots and possible hail." Needless to say, we hastily broke camp and hurried back to Hannabel to prepare for the blow. The sky darkened and a very ominous roll cloud appeared just as we approached Hannabel from the dinghy. Erin, the girls and the dog all prepared to hunker down in the cabin as I scurried about on deck in gusty winds and a light drizzle tying down the sails and worrying about the anchors holding. As several strong wind gusts blew across our bow, I quickly decided that I'd feel safer picking up one of the many vacant nearby mooring balls rather than trusting our undersized anchors. All ended up well as Erin masterfully maneuvered Hannabel under power while I secured a bowline to a mooring ball just as the storm hit with full force. We hustled down into the cabin and finished our dinner with all hatches and hatch boards secured for a damp, rolly start to our evening. The storm moved on after about an hour and we enjoyed a pleasant evening on the mooring. 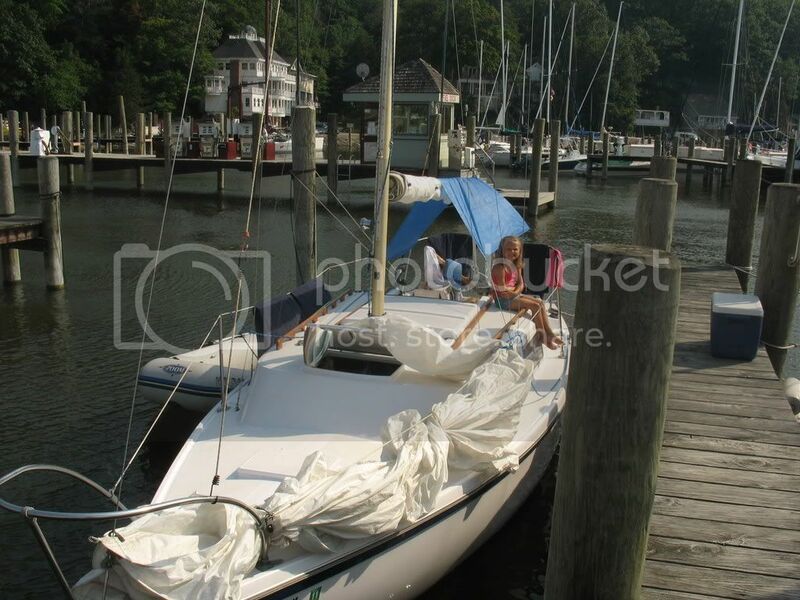 The next morning, decided to abandon our plans for Saugatuck and grab a slip at Eldean Shipyard to enjoy the pool, hot tubs, restaurant and many other beautiful cruising sailboats at the marina. Hannah and Izzy were thankful for a warm pool while Erin and I truly savored walking the docks and looking at all of the sticks in the harbor. After two nights in Holland, we decided to head back to Grand Haven because of many severe thunderstorms in the forecast for the next several days. We left Holland at about 8:00am on Friday morning with strong winds (20 knots) out of the south and 4-6 foot seas. As we motored out of the breakwater we all felt a little nervous and uneasy with the motion of the boat under power. Truly one of the greatest attributes of sailing vessels is their balance and relative comfort (compared to powerboats) while under sail. We raised the main with a single reef and shut of the engine. Hannabel quickly settled in to a nice comfortable rhythm and we gradually gained our confidence. With the seas and wind at our stern, we were able to let the main out and enjoy a nice surf to the north. After about 30 minutes, we decided to raise the 100% jib. After the jib was up, we sailed wing-and-wing northward at about 5 to 6 knots. Another hour passed and we felt like the wind had decreased a bit (perhaps 15-20 knots true?). 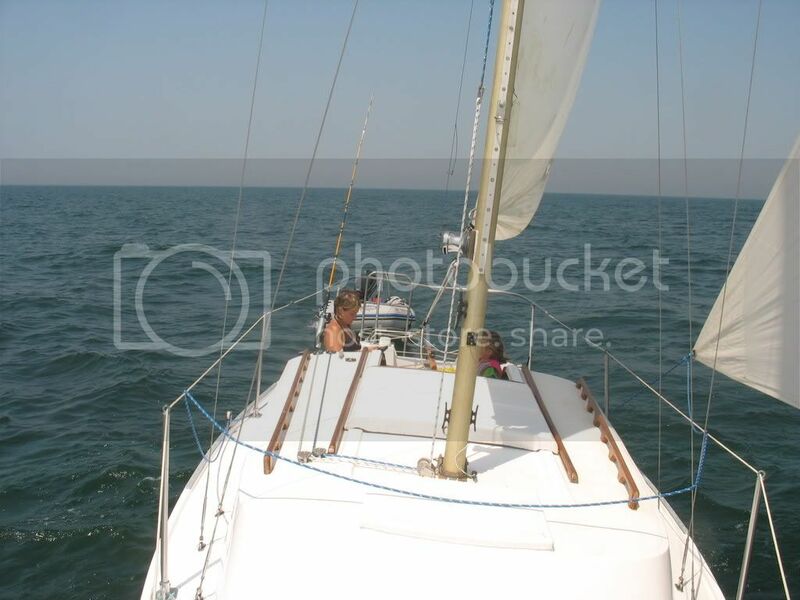 At that point I went forward on the deck and took down the jib and hanked on the 120% genoa. With a decrease in wind speed and a slight direction change we were able to cruise at an average of 6.5 knots on a broad reach all the way to Grand Haven. The steel drum music and sing/dancing of Isabel and Hannah made for a very enjoyable cruise home. The return trip took us about 4 hours, half the time of our initial trip.